Spooked by ghosts of conflicts past, UK lawmakers see the Arctic as a case study as they argue against defense cuts. To understand the British House of Commons report, released earlier this month, expressing concern about that country’s capabilities to conduct military operations in the Arctic, it is important to understand how Britain has experienced conflicts in other parts of the world in recent decades. Perhaps the most important, explains Klaus Dodds, an academic at the University of London, is the 1982 Falklands War, a 10-week conflict between the UK and Argentina over two British territories in the South Atlantic. Britain eventually turned back Argentina’s efforts to occupy the islands, which Buenos Aires claims as its own, but the outbreak of hostilities is widely blamed on signals sent by London in a review of its defense policy undertaken the year before. The review opened up the possibility that Britain would remove its only naval vessel in the region, something that was interpreted to mean that London was no longer interested in defending the Falklands. Fast forward to 2018: The British government is in the midst of a review of its defense capabilities that some in the defense establishment fear could result in reduced spending at a time when they see Britain increasingly beset by enemies, particularly Russia. Theresa May, the prime minister, has rejected any suggestion that the review will affect Britain’s status as a “leading defense nation.” Skeptics, however, remain unconvinced, given reports that she has asked her defense minister to justify whether the country should continue to be a “tier 1” military power — alongside the likes of the U.S. Regardless of which definition is ultimately applied, the sub-committee believes that it should describe a country that has the capability to operate anywhere in the world, including “the unique operating environment of the Arctic and the High North”, according to Madeleine Moon, the sub-committee’s chair. “Being able to do so is ultimately a question of resource and a question of ambition, and the sub-committee calls upon the government to show leadership in providing both,” she said. The report on the Arctic, for example, follows a 2016 defense committee report looking at the implications of a resurgent Russia for Britain. That report, similar to a 2015 House of Lords report, found that the Arctic was “not a militarised zone,” but because of the “increasing tensions” there, it concluded that a second, independent look at the region was necessary. Devoting a second defense report entirely to the Arctic made it possible to go into more detail about a region that is of genuine concern to the military, but Dodds suggests that for anyone familiar with British politics from the 1980s the similarities with the situation leading up to the Falklands War will be obvious. “When the report says that we need to pay attention to the Arctic, it is making a valid assessment of the defense situation in the region — Russia is building up its military — but between the lines it is reminding the government that it needs to be careful about the signals it sends,” he says. Dodds and others underscore that Britain’s military interest in the Arctic is nothing new. During the past 30 years, its strategic significance has declined as Cold War tensions eased and Western militaries turned to conflicts in what James Gray describes as “hot and dusty places.” But with Russia building up its military in the region, Gray, a member of parliament and chair of the defense sub-committee until last year, when work on the report began, believes increasing militarization is a return to normal. 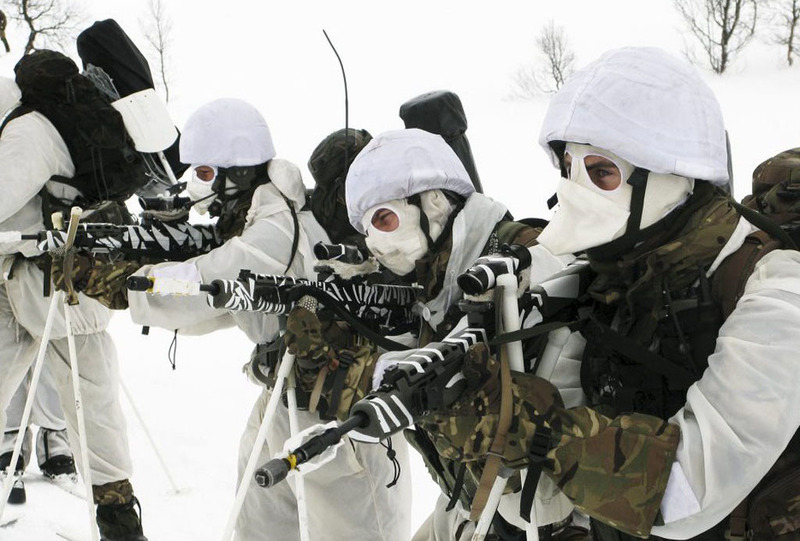 Although the Arctic never fell entirely out of British military thinking — its forces regularly participate in cold-weather training in Norway, a fellow NATO member — most of its attention in recent years has been on preparing soldiers to fight in Iraq and Afghanistan. With those conflicts no longer a priority, Gray believes more time to should be spend preparing to counter a Russian threat in the Arctic. Russia’s 2014 annexation of Crimea and its suspected involvement in ongoing separatist violence in eastern Ukraine are often held up as examples of what Russia might be trying to achieve by building up its military in the North. Training forces to operate in he North, Gray believes, is one way of letting Moscow know that NATO would not let military action of that sort go unanswered. Ultimately, Gray believes a conflict with Russia in the Arctic is unlikely. But if one happens, the consensus amongst Britain’s military establishment, is that it will happen over Svalbard. Officially Norwegian, but home to about 500 Russians and demilitarized under international treaty, Svalbard provides the perfect mix of legitimate Russian interest and legal uncertainty for Moscow to test NATO’s willingness to respond to provocation. Also working in Moscow’s favor, Gray adds, is Svalbard’s location. “The average person in Britain wouldn’t be able to find Svalbard on a map, let alone be able to tell you why we should fight over it,” he says.